The program is divided into two basic units, classroom instruction and applied learning (hands on). The foundation of landscaping and horticulture is found in science. Classroom instruction will focus on greenhouse production, plant science, integrated pest management, landscaping principles, vegetables, fruit production, customer service and operating a student-run business. All instruction focuses on students being able to apply their knowledge outside of the classroom in practical experiences. The applied learning section of program allows students to actively grow a variety of plants, design and install landscape plans, and participate in numerous hands on activities. We operate two greenhouses, beautify the landscape in the local community, and spend time on local farms engaged in a variety of plant management activities. Students have the opportunity to operate a tractor with mini-back hoe, lawn mowers, string trimmers, and a wide variety of hand tools. 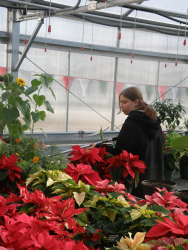 They also practice landscape and floral design, create holiday wreathes, and develop sales and marketing skills by selling plants and produce from our greenhouses. While engaged in the applied learning portion of class students are actively working outdoors or in greenhouse environments. Therefore, students are required to have appropriate clothing every day. Work boots are highly recommended and clothing suitable for outdoor work on a daily basis is expected. Students have a locker to leave boots, rain gear, sunscreen, or work clothes for their daily use.